Paused. The Toy Lazfar Project. Hello everyone. Sorry again for the massive delay. I have decided to suspend work on the Toy Lazfar project for now….it seems that it has not been going as smooth as I thought in it’s schedule, so I thought I would stop it for now & resume it when I have the time to focus on it once more. In the meantime, I thank you very much for keeping up to date with what I’m doing. I shall leave you with a few animated sprites of the characters. I will also try to post some other work here when I get the opportunity. Bye for now. This footage is my own and is not permitted to be used commercially. Please ask my permission before using this. An animated gif of toy lazfar pushing: (used in the intro of the footage). 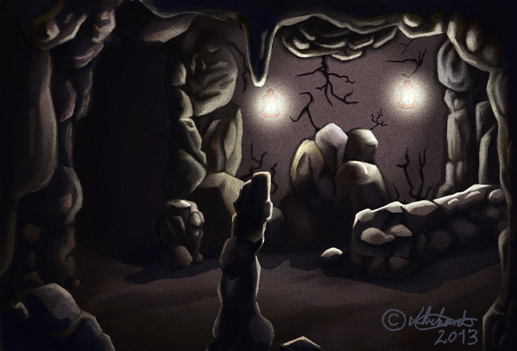 This is a concept art drawing of the area where a cave dweller character would be encountered during the game. *Note- the graphics of all areas/levels in the coming game footage will be more “old school”, and pixelated. Much like those old 8-bit games looked. But this is just a design for reference. Hope you enjoy it, all. Bye for now! 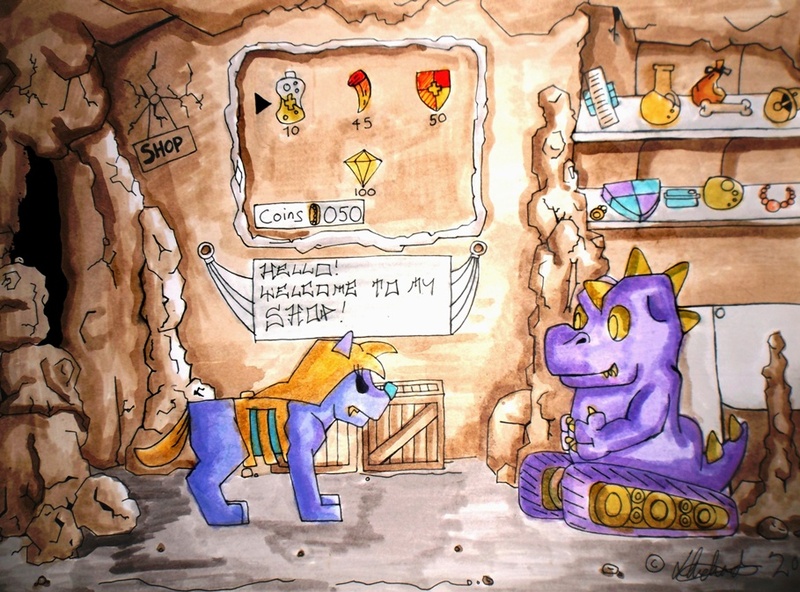 A rough of Dinotank’s shop in the Toy Lazfar game footage. Cheers and I hope you like it. Feel free to post a comment here if you wish. Comments are appreciated. Hello all! SO sorry for such a long delay in posting, please see above, an animation test of Toy Lazfar howling! You see, I have been SOO busy with my work, with my exhibition, and with the local press! That’s right! I’ve been in my local paper about my project! At the moment, I’m still pretty busy. I have come a long way with my Toy Lazfar project, & I’m getting close to completing it! I am on the animation phase now, (specifically the animatic test stage), and I’m working harder than ever, so please bear with me! To my followers, and the rest of you who like to come, A HUGE thanks to you for still following me!!! 😀 Bye for now and hope you enjoy! PLEASE FEEL WELCOME TO REBLOG THIS POST! THANKS! Hello everyone! Have a look at the poster above! Please Feel free to download and share it! 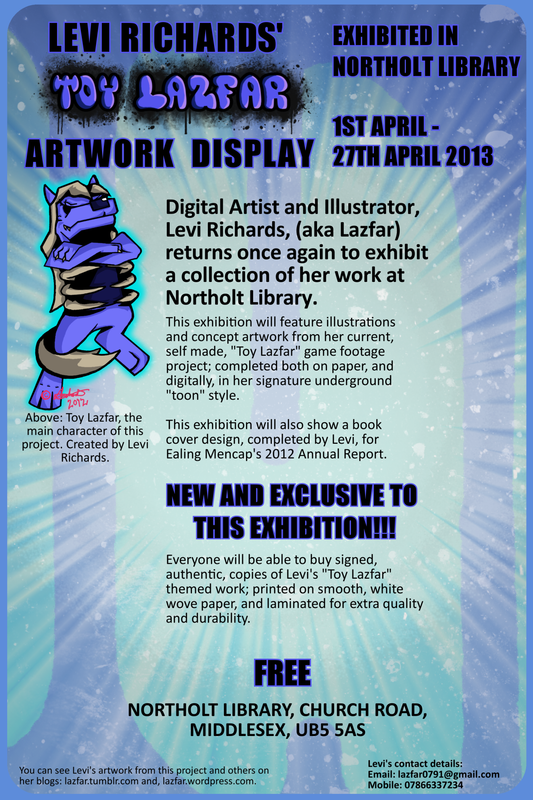 I have an art exhibition coming up in April! It starts on the 1st of April and ends on the 27th of April 2013 at Northolt Library, in Northolt, in the London borough of Ealing! If you are able to come and see my exhibition, then you are more than welcome to! Remember, it lasts from the 1st to the 27th of April! If you wish to contact me about it, please post a comment here! That’s all. Thank you so much! Enjoy, and I very much hope to see you soon! Cheers!